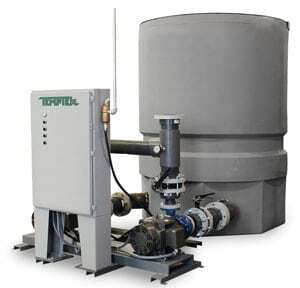 Pump tank systems support cooling equipment including evaporative cooling towers, central chillers and fluid coolers. A vented reservoir with fluid pumps and controls specifically selected to meet the needs of your process and/or entire facility. The standard unit is designed to be installed indoors or protected from the elements. Offered for Tower and Chillers water systems. Tower systems are accommo- dated to 1000 tons and chilled water systems up to 600 tons. 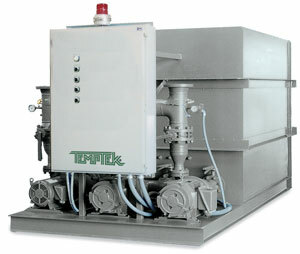 Offered for tower water systems to 1000 tons, and chilled water sys- tems to 600 tons.